In my opinion, prepper water storage is one of the biggest challenges for preppers. There are so many questions. How much water should you store? Where should you put your water? Others debate if it is even necessary to have prepper water storage. Yes, there are many resources to collect water from when the grid is up. However, many debate whether if water will be truly hard to find in a collapse or grid down scenario. 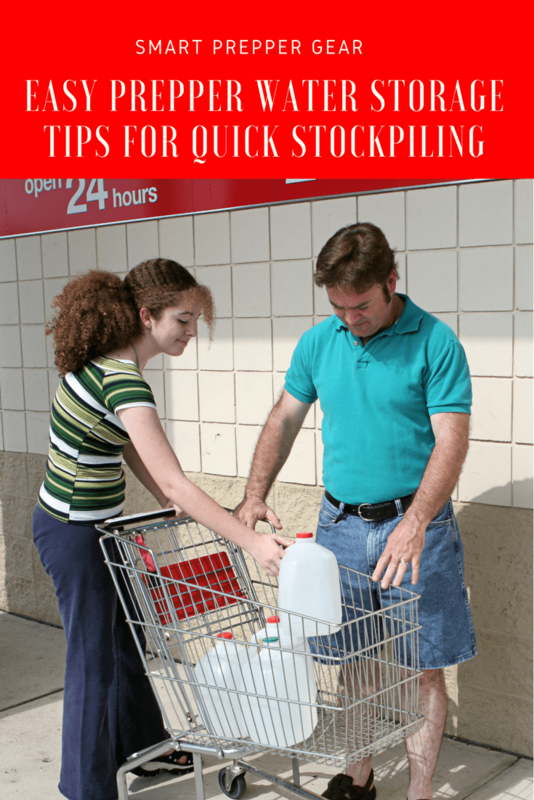 In the post, we are going to share easy tips on prepper water storage for quick stockpiling. Why do you need prepper water storage? According to the Rule of 3’s you can only survive 3 days without water. This is the one most important aspects of survival. This is after having a shelter to survive the conditions. Being that you can only survive three days without water it is important to have quick and easy access to it. This includes having it stored at home but also in your bug out bag and retreat if you have one. In an SHTF or grid down scenario, you may still have access to water through your faucet. However, there is the risk of the city water being contaminated. There have been times here in Florida after a hurricane where the water was turned off. Prepper water storage is not only important for quenching your thirst but also for hygiene. Many people die after disasters due to poor hygiene. Wounds can be infected and diseases spread easily when there is poor hygiene. The general rule of thumb is that you need one gallon of water per person per day. Now, we typically use a lot more water than that on a daily basis. However, when it comes to survival this would be the least amount recommended. This recommend amount also varies depending on special circumstances. For example, if you live in hot and humid climates then you may need more water than that. Another factor to consider is if you have a pregnant family member. Then they are going to need more to stay hydrated. Also, if you are bugging out on foot then you may need more than one gallon. Having at least one gallon of water per person per day will help you survive. However, water keeps you energized. It helps you to function correctly. So if you not only want to survive but to thrive then you may want to store more. This will increase your survivability. In the preparedness community, there is a lot of debate on how much you need. Organizations like FEMA recommend having at least 3 days’ worth of water. Then there are many preparedness and survival experts that recommend stockpiling up to 2 years of water supply. My opinion is that you want to at least have the bare minimum of 3 days’ worth. Ultimately, your preparedness plan will affect how much water you really need. Each of us is preparing for different threats. Some of us are preparing for a nuclear fallout which is a more long-term survival situation. This is in comparison to someone that is only preparing for localized natural disasters with a shorter recovery time. So I recommend completing a prepper threat assessment that I talk about in The Strategic Prepper eBook. This will give you a better idea of the more realistic threats that you need to prepare for. From there you can determine how much prepper water storage you truly need. This is obviously one the easiest way to build your prepper water storage. You can quickly build up a supply. Furthermore, you can purchase water that you enjoy. Some of us don’t like tap water like me. To me, it has a different taste and smell. So I typically go with spring water over the tap and purified water. This is a personal preference of course. However, when it comes to survival you want to be drinking something that you enjoy and refreshes you. This will help to build your morale in such a dramatic event. Tap water is the easiest and quickest way to build your prepper water storage. You have quick access to it because it is in your house. Furthermore, you are not paying as much as you would pay at the store. That is if you have to pay for your water at all. Now, I don’t have tap water stocked for my drinking supply. However, I will use it for hygiene. The final source of water to build your prepper water storage is from renewable natural resources. As a prepper, it should be the goal to eventually be self-sufficient. The less dependency you have on others the higher your survivability. This is why I say in The Strategic Prepper eBook that having your own renewable water resource is a survival multiplier. Renewable natural resources include bodies of water like lakes, ponds, creeks, and springs. If you have this resource on your own land then this will increase your survivability. However, I would say that it makes you a potential target in a collapse scenario. If people know that you have one of these natural resources then they will be flocking to your property once they have run out. So this can be a security concern. This is why it is important to have layers of security on your property. So it is great to have a renewable natural resource of water on your property. However, I wouldn’t recommend that it be close to your house. That way if you are not able to properly defend it you can fall back to house or bug out. One great discreet option to have is a groundwater pump or well. These can be covered up so that it cannot be easily seen. Another downside of relying just on a natural renewable resource is that it could be affected by radiation and other contamination. In a fallout event, there is the potential that radiation could fall into that body of water. You also have to consider getting beaver fever from other animal feces. A quick and cheap way to build up your supply is by reusing old bottles. Preferably you want to use old water bottles. However, you can use old soda and juice bottles as well. These smaller bottles will help you take advantage of smaller spaces around your home. A lot of us live in smaller apartments and homes leaving us limited on storage space. So the old soda bottles can fit into smaller nooks in your pantry. You could even place them in places like under your bed. If you use this method you will want to make sure that you properly clean these containers. This can be done by cleaning the bottles along with the cap using dish soap. Then sanitize the bottles using 1 teaspoon of bleach mixed with 1 quart of water. Dry and then fill the bottles along with a water purification tablets. If you live in a small space then you should look into picking up some water bricks or canned water. Again, you can take advantage of the smaller spaces in your home. The water bricks can fit under small spaces like couches. I’ve even seen preppers place them in drawers and make furniture decorations out of them. Also, there are collapsible water bags that don’t take up much space either. The bags will actually conform to the place that it is in. Plus, they have a great handle so that you can quickly take them with you in an emergency. Ideally, you will want to use food grade jugs if you can afford them. On top of that, you will want to make sure that the plastic jugs are GPA free. After a certain amount of time, regular plastics begin to shed and pollute your water. Food grade plastic jugs are typically dark blue. This color restricts light and helps prevent the growth of algae. You don’t want to store them in stainless steel because you wouldn’t be able to treat them with chlorine. Chlorine will corrode steel. A great option for food grade plastic jugs is 7-gallon stackable containers. These containers are easy to fill and pour in. They are also sealed. The downside with these jugs is that they are not easy to transport like store-bought water. So, of course, you wouldn’t be able to store them in your bug out bag. Store bought water bottles are probably the best options for your bug out bag. Water barrels are a great option for prepper water storage during a long-term recovery event. These bad boys give you the ability to store 55+ barrels of water. It is also great if it is attached to a rain catchment system or gravity fed water system. However, there are a couple of downsides with water barrels. They really aren’t ideal for preppers who live in small apartments or homes. Another downside is that they can draw unwanted attention from those who are looking for water after a disaster. This is the final and last option that I would consider for prepper water storage. Typically you will want to use your bathtub to clean. However, in an emergency situation, these could be filled before a potential threat. Now, I wouldn’t recommend drinking straight from a bathtub. Even if you clean them to the best of your ability it can still be dirty. So it’s not the cleanest option. However, there is a great tool called the WaterBOB. This can sit inside of your tub and connects to the faucet. This will give you the ability to fill the tub and still be able to drink from it. It ensures that your tub doesn’t contaminate your water. Altogether this can give you up to 100 gallons of prepper water storage. If you have two bathtubs then you should just fill one and use the other to clean. Like I mentioned earlier, you will want to take care of your hygiene after a disaster. When it comes to prepper water storage it is helpful to diversify your options. You don’t want to solely rely on one solution. It is a common saying among preppers that you should have backups to your backups. For example, if your prepper water storage system uses water barrels then you should consider having another type like store bought water jugs. That way if your barrels are stolen then you still have a backup. Next: How Does a Solar Oven Work?